By Jonathan C. Malone, MD; Kevin S. Preston, MD; Hillary W. Garner, MD; Joseph M. Bestic, MD; Daniel E. Wessell, MD; and Jeffrey J. 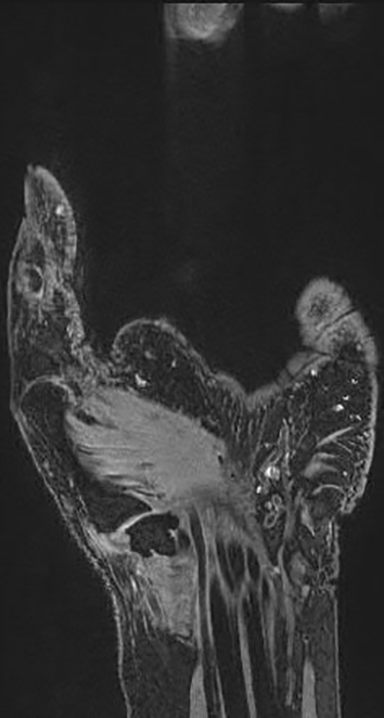 Modern magnetic resonance imaging (MRI) techniques and high-quality surface coils can provide exquisite anatomic detail of the small extremities such as the hands and feet. The fine soft tissue contrast resolution provided by MRI allows accurate identification and characterization of a variety of traumatic injuries, arthropathies, and neoplastic processes. Recent advances in gradient hardware, coil design and pulse sequences, as well as the proliferation of 3 tesla (T) MR units, allow very small field-of-view imaging at high resolution.1 3T magnets provide increased signal-to-noise ratio (SNR) and contrast-to-noise ratio (CNR) compared to 1.5T magnets. Dedicated multichannel hand and wrist coils further optimize signal to noise ratios. In addition, these coils facilitate optimal patient positioning. When coupled with appropriate imaging protocols, 3T imaging of the hand can offer improved diagnostic outcomes through superior visualization of the articular cartilage and small supporting soft tissue structures of the hand. Limiting the field of view to the area of interest is vital to optimizing anatomic detail when imaging the small structures of the hand. Multisequence, T1-weighted and fluid-sensitive imaging is generally performed in the axial plane and in at least one orthogonal longitudinal plane, prescribed as either coronal or sagittal based on the anatomy of interest. Multiplanar, high-resolution, isotropic sequences are also helpful for evaluating the thin articular hyaline cartilage as well as the ligaments and other small intrinsic structures of the hand and fingers. 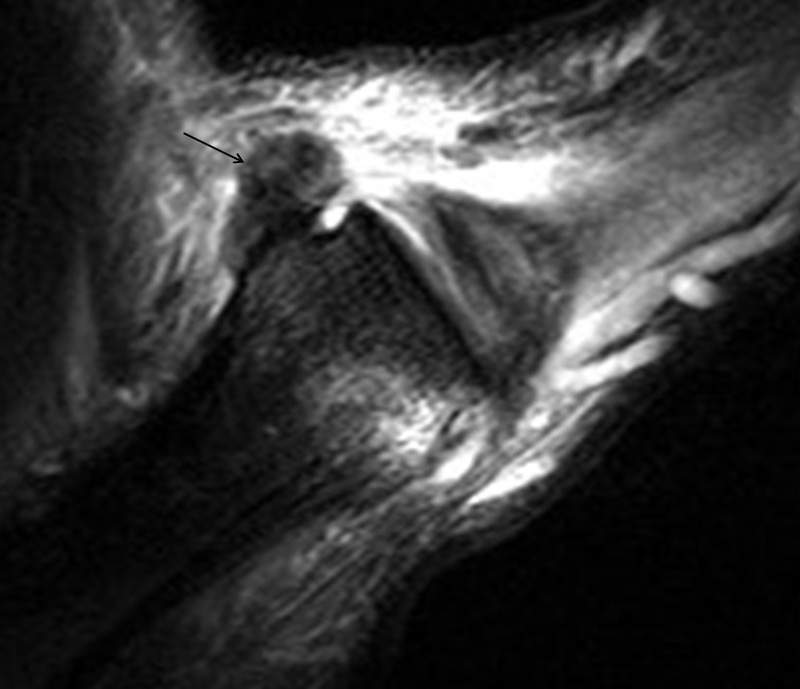 In the dorsal aspect of the hand, the digital branches of the extensor digitorum (ED) tendon trifurcate distal to the metacarpophalangeal (MCP) joint. A central band from each ED branch inserts on the dorsal aspects of the bases of the lesser middle phalanges. Radial and ulnar bands continue more distally to insert on the dorsal aspects of the bases of the distal phalanges.4 In combination with the radial and ulnar bands, the extensor hoods of the lesser digits provide dorsal stability by preventing subluxation or dislocation of the ED branches.5 (Figure 2). The fine soft-tissue contrast resolution of MRI allows assessment of the tendons, ligaments, and intricate pulley systems of the fingers. Normal tendons and ligaments of the hands typically demonstrate low signal intensity on MR imaging. In contrast, these structures exhibit increased signal intensity or abnormal morphology when injured. The major function of the flexor pulley system is to secure the flexor tendon along the fibro-osseous tunnel and stabilize the tendon during flexion. Injury may occur anywhere along the pulley system, resulting in abnormal “bowstringing” with development of an abnormal gap between the flexor tendon and the underlying bone with flexion of the digit (Figure 9).5 The most frequently injured component is the A2 pulley, followed sequentially by injury to the A3 and A4 pulleys. Injury to the A1 pulley is rare. 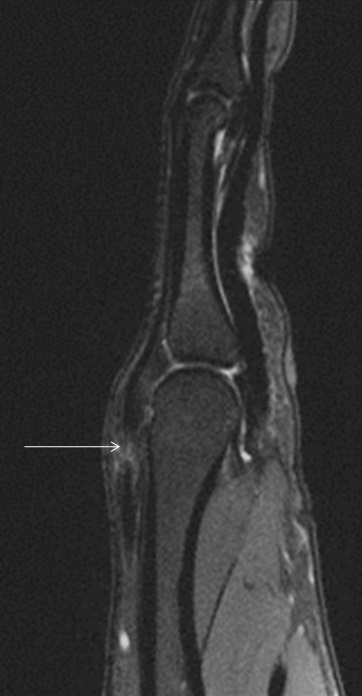 MRI has become a valuable tool in the assessment of radiographically occult fractures. It has demonstrated similar specificity and superior sensitivity compared to CT, making it the gold standard for fracture detection.11 However, its high cost limits routine use in the hands and fingers, particularly since the results rarely alter the original treatment plan of splinting, rest and pain control. Cartilage damage in the hand and fingers is a feature common to several disease processes commonly associated with those of a degenerative, inflammatory, or infectious nature. The resultant cartilage damage is irreversible, and disability can be significant. Currently, there is wide research interest on earlier identification of active disease in order to prevent cartilage damage and disability. MR imaging of the hand has a few advantages over radiography in the evaluation of hand and finger arthropathies. 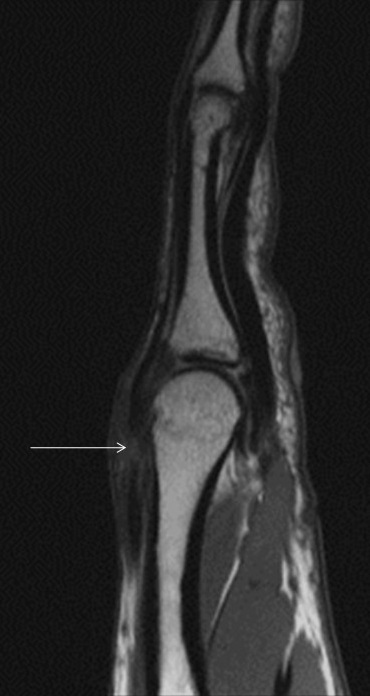 For example, joint spaces may appear preserved on radiographs in the setting of synovitis or joint effusion, falsely implying normal cartilage, whereas MRI allows direct visualization of the articular cartilage. 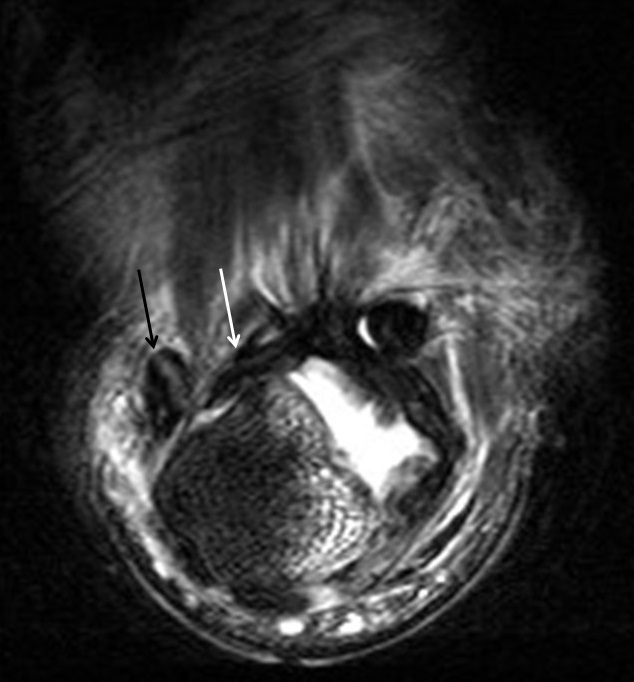 MRI is also able to detect small T2 hyperintense subchondral cysts and erosions before they are radiographically apparent. 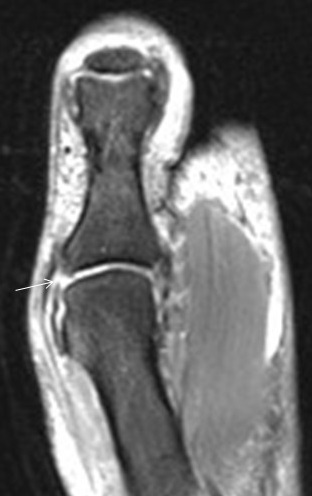 Erosions usually manifest on MRI as sharply marginated marrow signal abnormalities, often with enhancement after gadolinium administration and indicative of the presence of synovitis or active hypervascular pannus. Focal low T1 and high T2 marrow edema-like signal may be a precursor of an erosion. 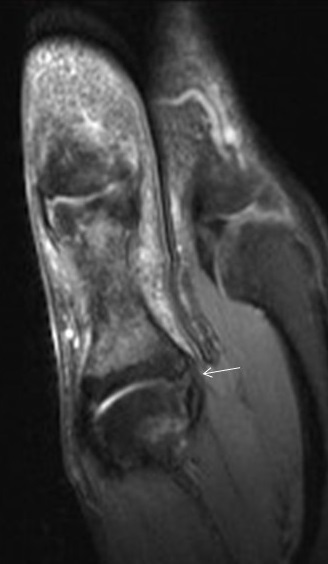 MRI findings of synovitis include abnormal T2 hyper intensity and thickening of the synovium (normally paper-thin), with or without effusion. 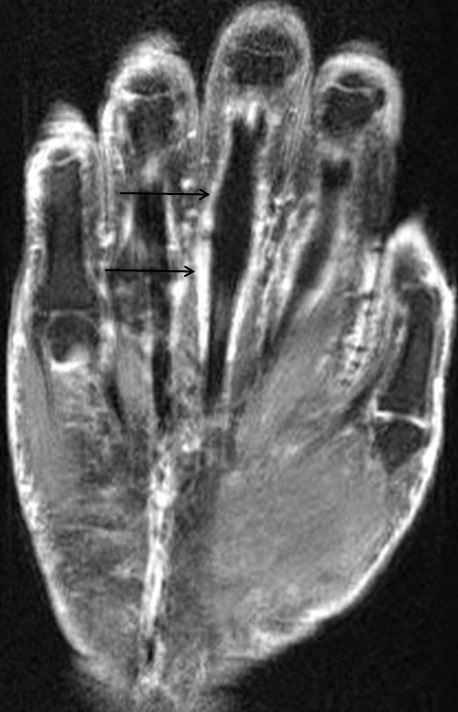 Intravenous contrast is necessary to differentiate synovitis from synovial fluid.12 Simultaneous high-resolution imaging of both hands may be performed utilizing a “praying hands” protocol, which is helpful in the evaluation of early active systemic inflammatory arthropathies, with excellent demonstration of the symmetry or asymmetry of involvement. 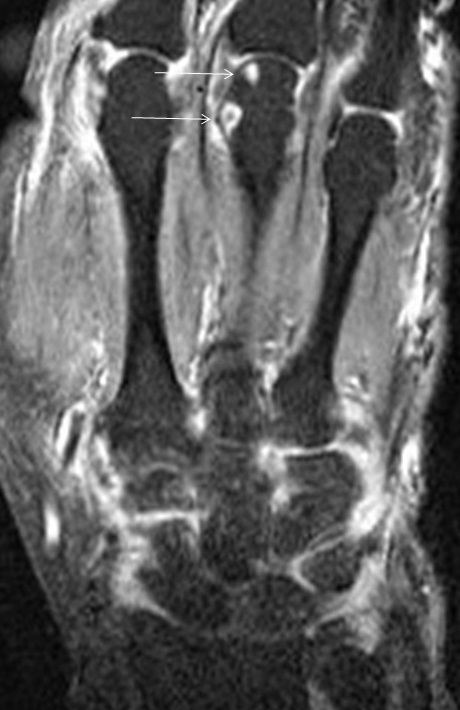 Rheumatoid arthritis (RA) is an uncommon chronic systemic inflammatory arthropathy affecting approximately 0.5-1.0% of the population, although the prevalence appears to be increasing.15 RA manifests as a proliferative, hypertrophic synovitis that leads to bone erosion and cartilage destruction. Within the upper extremity, RA preferentially involves the wrist and MCP joints. The characteristic radiographic findings of symmetric or concentric joint space narrowing and marginal erosions indicate the presence of irreversible cartilage and bone damage. Greater availability and positive outcomes associated with disease-modifying agents warrant the use of MRI to recognize RA at its earliest stage before irreversible damage occurs. MR allows more prompt and precise detection of synovitis, tenosynovitis, bursitis, early or small erosions, and osteitis (Figures 15, 16). 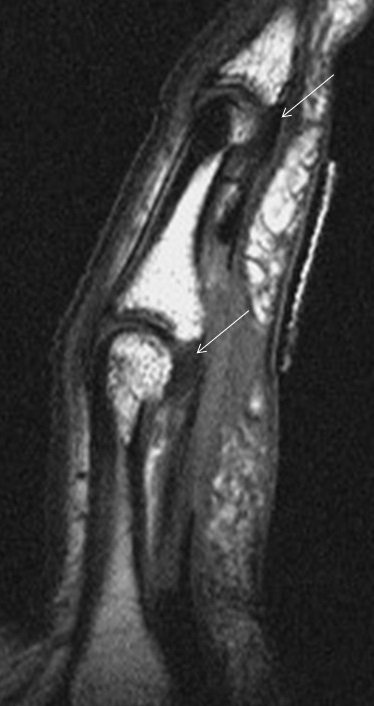 Proliferative synovitis is the earliest recognized pathologic finding in RA, and is a predictor of future indelible damage.16 Tenosynovitis is also a common feature of RA, particularly involving the flexor digitorum, extensor digitorum, and extensor carpi ulnaris tendons (Figure 17). 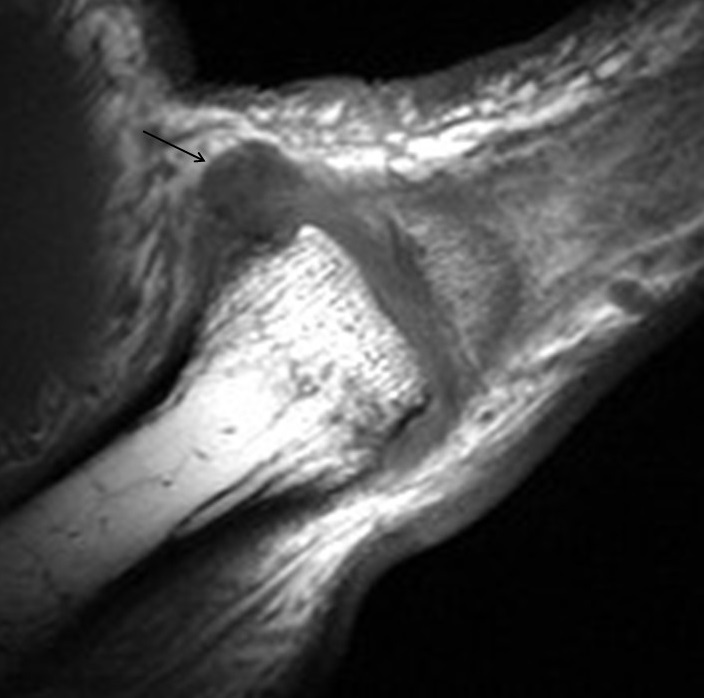 Erosions typically occur at the second and third metacarpal heads, carpus and ulnar styloid. Septic arthritis is an arthropathy caused by an intra-articular infection that leads to joint destruction. Risk factors include bacteremia, immunocompromised state, rheumatoid arthritis, and prior penetrating injury. Septic arthritis should be considered in the setting of acute monoarticular arthritis, particularly with the accompanying clinical signs and symptoms of joint pain and fever. Early diagnosis and treatment is essential in the setting of septic arthritis with still intact articular cartilage to prevent the immediate risk of irreversible damage and subsequent secondary osteoarthritis. 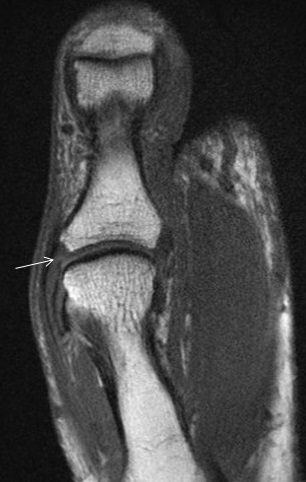 On MRI, the presence of monoarticular arthritis and synovitis with associated subchondral marrow edema-like signal is typical for septic arthritis in the appropriate clinical setting. 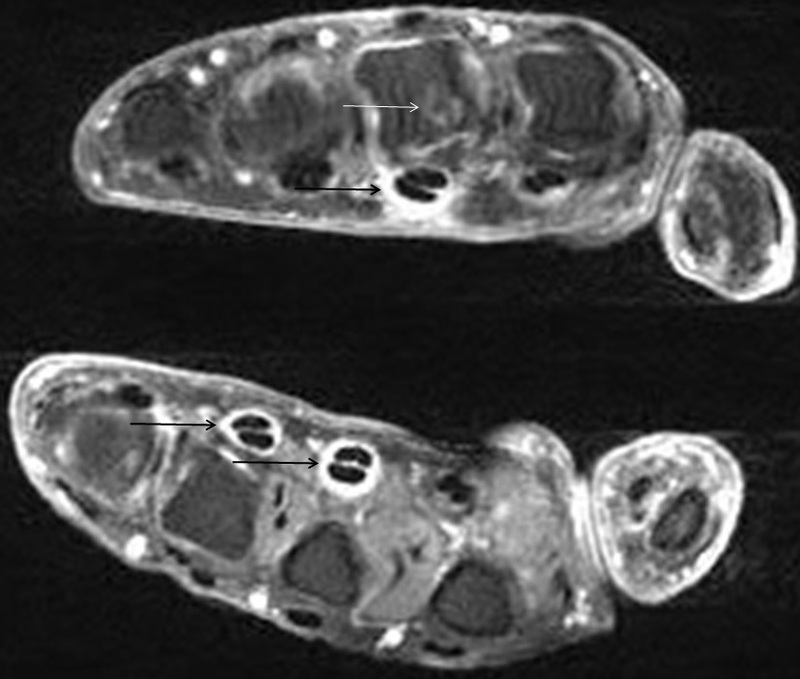 Osteomyelitis usually occurs in the presence of a skin defect or prior penetrating injury and is characterized by confluent marrow edema-like signal and cortical destruction (Figure 19). T1-weighted images are the most reliable for confident detection of osteomyelitis, as fluid-sensitive sequences can demonstrate similar signal alterations in both non-infectious reactive changes and in osteomyelitis. Imaging should include T1-weighted and fluid sensitive imaging in at least two planes, tailored to anatomic location to optimize visualization of the tumor and surrounding tissues. Contrast enhancement with gadolinium is often useful for further delineation and characterization. Magnetic resonance angiography (MRA) may occasionally be of benefit to depict vascular involvement. Tenosynovial giant cell tumor or giant cell tumor of tendon sheath is also commonly seen about the hand and fingers, second only to ganglia.25,36 As the name implies, lesions will be intimately associated with a tendon sheath and most commonly involve the flexor tendons.25,36 Lesions are typically nodular in shape with low signal intensity on fluid sensitive sequences related to hemosiderin within the lesions.36 Giant cell tumor of the tendon sheath shows variable enhancement following intravenous gadolinium administration. Hemangioma and other vascular anomalies can also be seen. Hemangiomas histologically appear similar to normal blood vessels and often contain significant nonvascular tissue including adipose tissue.25,38 MRI often allows confident diagnosis of soft tissue hemangiomas. 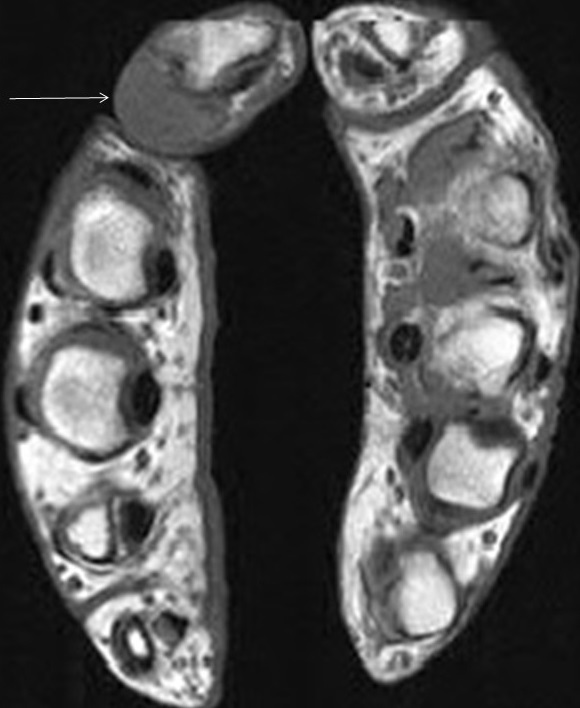 T1-weighted images often show ill-defined lesions which are predominantly isointense in signal to skeletal muscle but often contain internal areas of fat signal, forming fibrofatty septa within the lesion.25,39 T2-weighted images depict hyperintense signal, which is often serpentine as would be expected of the vascular structures composing the lesion.25,39 Fluid-fluid levels and phleboliths can be seen in slower flow lesions. 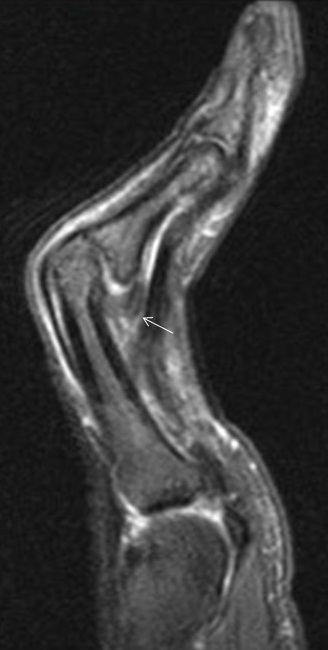 Current MRI techniques of the hands and fingers provide a valuable tool for assessment and characterization of traumatic injuries to small structures, various arthropathies, and neoplastic processes. As imaging quality continues to improve, the practicality and value of MRI of the hand and fingers becomes more apparent in the evaluation and management of these entities. Peterson JJ, Bancroft LW, Kransdorf MJ. Principles of bone and soft tissue imaging. Hand Clin. 2004 ;20(2):147-166. Thompson, JC. Netter’s Concise Orthopaedic Anatomy, 2nd ed. Philadelphia, PA: Saunders/Elsevier, 2010. Lutskey KF, Giang EL, Matzon JL. Flexor tendon injury, repair and rehabilitation. Orthop Clin North Am. 2015;46(1):67-76. Resnick D, Kang HS. Internal Derangements of Joints. 2nd ed. Philadelphia, PA: Saunders/Elsevier; 2007. Clavero, JA, Alomar X, Monill JM, et al. 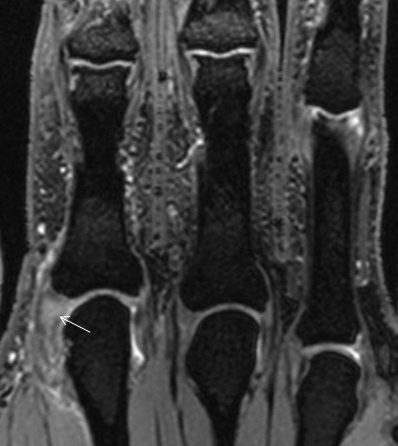 MR Imaging of ligament and tendon injuries of the fingers. Radiographics. 2002;22(2):237-256. De Maeseneer M, Van Roy P, Jacobson JA, et al. 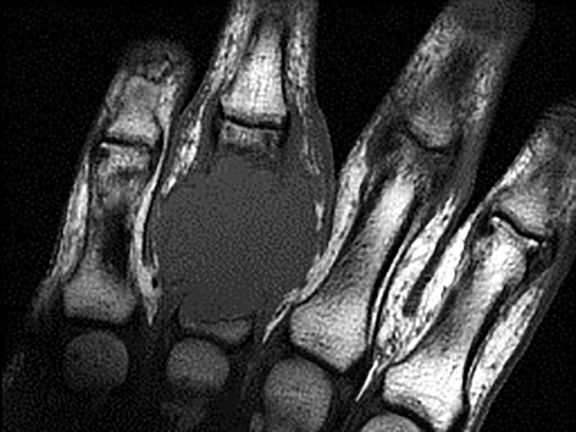 Normal MR imaging findings of the mid-hand and fingers with anatomic correlation. Eur J Radiology. 2005; 56: 278-285. Lifchez SD. Flexor tendon injuries. Orthopedics. 2011;34(9):710-711. Hauger O, Chung CB, Lektrakul N, et al. 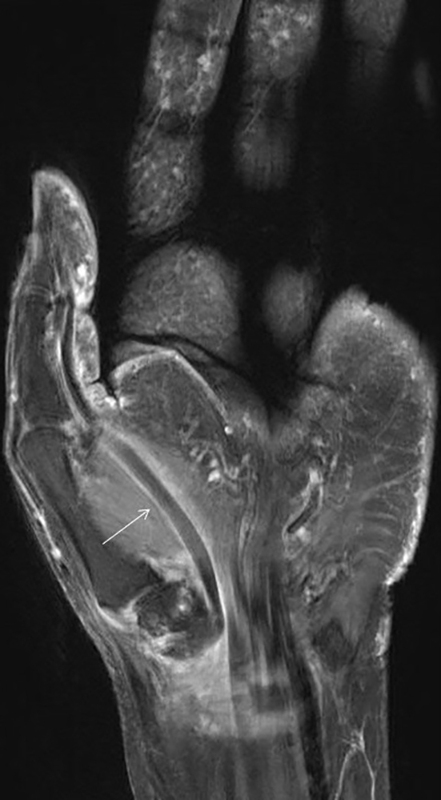 Pulley system in the fingers: normal anatomy and simulated sesions in cadavers at MR imaging, CT, and US with and without contrast material distention of the tendon sheath. Radiology. 2000; 217(1):201-212. Talwalkar SC. Ligament injuries of the hand. Orthopaedics and Trauma. 2014; 28(4): 225-229. Theumann NH, Pessis E, Lecompte M, et al. MR imaging of the metacarpophalangeal joints of the fingers: evaluation of 38 patients with chronic joint disability. Skeletal Radiol. 2005; 34(4):210-216. Jarraya M, Hayashi D, Roemer FW, et al. Radiographically occult and subtle fractures: a pictoral review. Radiology Research and Practice. 2013. Ostergaard M, Peterfy C, Conaghan P, et al. 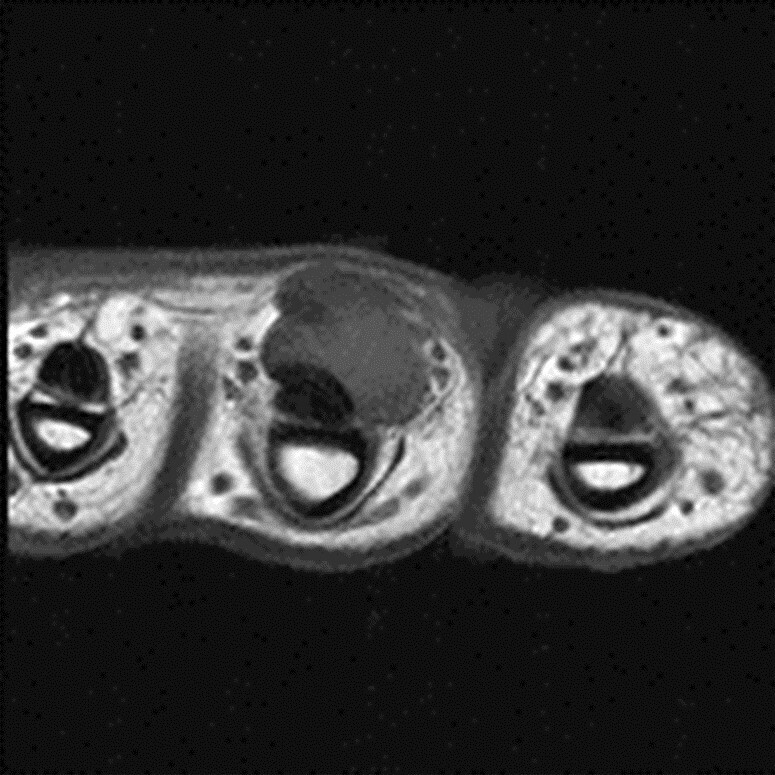 OMERACT rheumatoid arthritis magnetic resonance imaging studies. 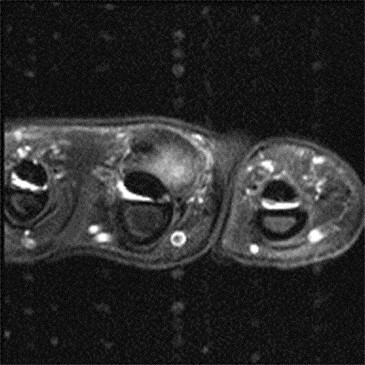 core set of MRI acquisitions, joint pathology definitions, and the OMERACT RA-MRI scoring system. J Rheumatol. 2003; 30(6):1385-1386. Haugen IK, Englund M, Aliabadi P, et al. Prevalence, incidence and progression of hand osteoarthritis in the general population: The Framingham Osteoarthritis Study. Ann Rheum Dis 2011, 70(9):1581-1586. Haugen IK, Slatkowsky-Christensen B, Bøyesen P, et al. 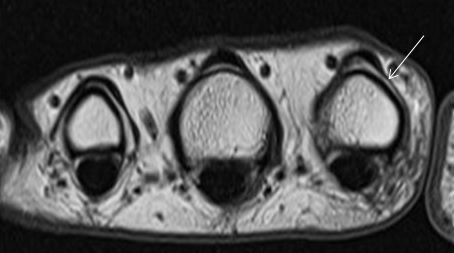 MRI findings predict radiographic progression and development of erosions in hand osteoarthritis. Clin Epid Res. 2014. Myasoedova E, Crowson CS, Kremers HM, et al. Is the incidence of rheumatoid arthritis rising? : results from Olmsted County, Minnesota, 1955-2007. Arthritis Rheum. 2010;62(6):1576-1582. Boutry N, Morel M, Flipo R, et al. Early rheumatoid arthritis: a review of MRI and sonographic findings. AJR Am J Roentgenol. 2007;189(6): 1502-1509. McQueen FM, McHaffie A, Clarke A, et al. 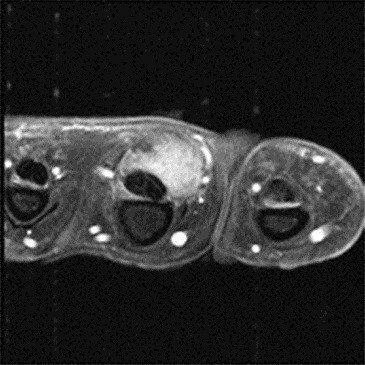 MRI osteitis predicts cartilage damage at the wrist in RA: a three-year prospective 3T MRI study examining cartilage damage. Arthritis Res Ther. 2014;16(1):R33. Turesson C, Jacobsson LT. Epidemiology of extra-articular manifestations in rheumatoid arthritis. Scand J Rheumatol. 2004;33(2):65-72. El-Noueam Kl, Giuliano V, Schweitzer ME, et al. Rheumatoid nodules: MR/pathological correlation. J Comput Assist Tomogr. 1997;21(5)796-799. Spira D, Kotter I, Henes J, et al. 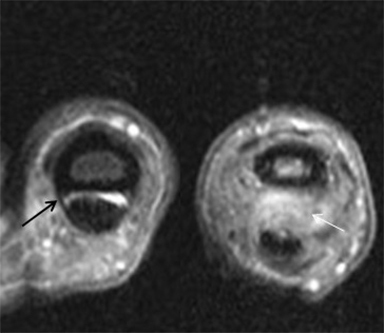 MRI findings in psoriatic arthritis of the hands. AJR Am J Roentgenol. 2010;195(5):1187-1193. Boutry N, Hachulla E, Flipo RM, et al. MR imaging findings in hands in early rheumatoid arthritis: comparison with those in systemic lupus erythematosus and primary Sjögren Radiology. 2005;236(2):593-600. Kransdorf MJ, Meis JM. From the archives of the AFIP. 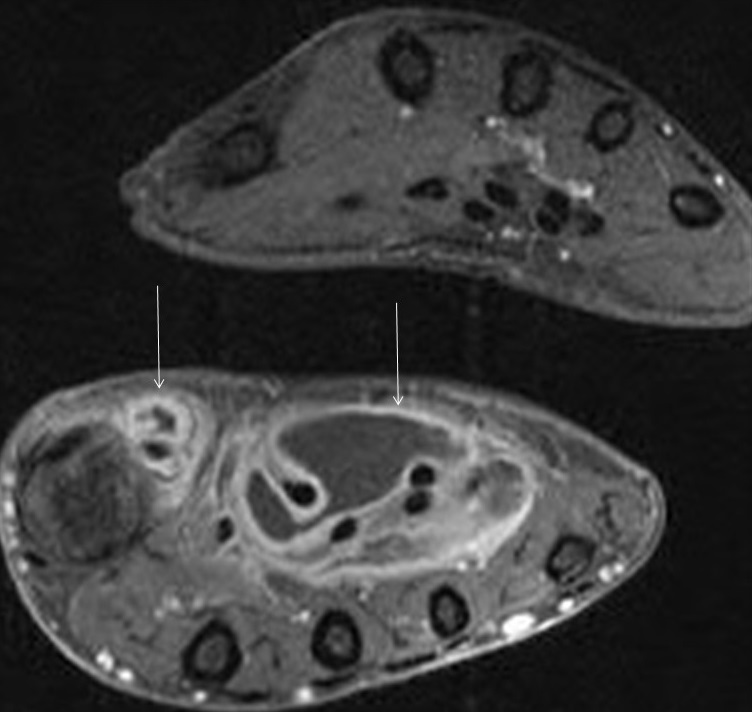 Extraskeletal osseous and cartilaginous tumors of the extremities. Radiographics. 1993;13(4):853-884. Garcia J, Bianchi S. Diagnostic imaging of tumors of the hand and wrist. Eur Radiol. 2001;11(8):1470-1482. Murphey MD, Flemming DJ, Boyea SR, et al. Enchondroma versus chondrosarcoma in the appendicular skeleton: differentiating features. Radiographics. 1998;18(5):12131237. Kransdorf MJ, Murphey MD. 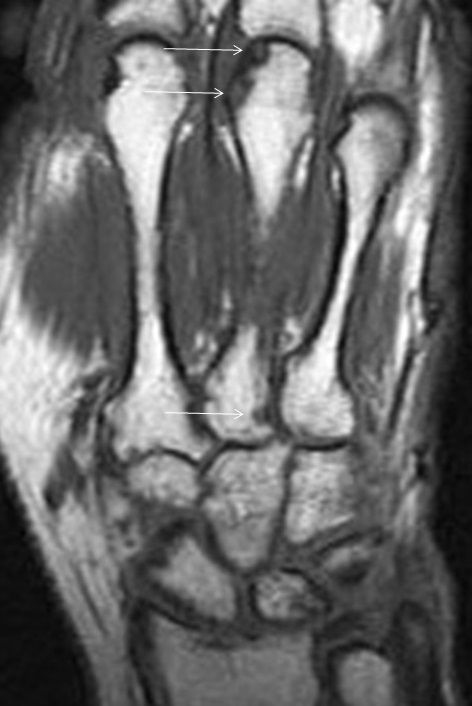 MR imaging of musculoskeletal tumors of the hand and wrist. Magn Reson Imaging Clin N Am. 1995;3(2):327-244. Milgram JW. The origins of osteochondromas and enchondromas. a histopathologic study. Clin Orthop Relat Res. 1983;174:264-84. Hudson TM, Hamlin DJ, Enneking WF, et al. 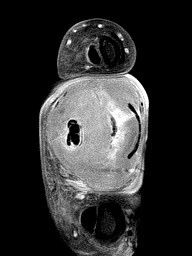 Magnetic resonance imaging of bone and soft tissue tumors: early experience in 31 patients compared with computed tomography. Skeletal Radiol. 1985;13(2):134-146. Bohndorf K, Reiser M, Lochner B, et al. 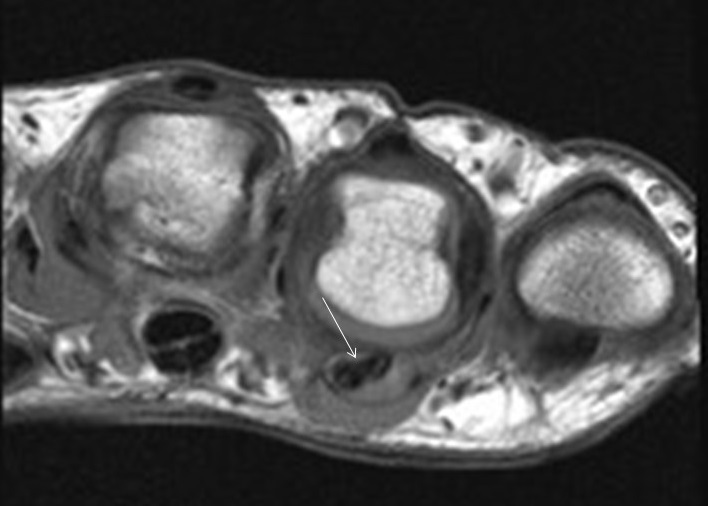 Magnetic resonance imaging of primary tumours and tumour-like lesions of bone. Skeletal Radiol. 1986;15(7):511-517. Kransdorf MJ, Sweet DE, Buetow PC, et al. Giant cell tumor in skeletally immature patients. Radiology. 1992;184(1):233-237. Dahlin DC. Giant-cell-bearing lesions of bone of the hands. Hand Clin. 1987;3(2):291-297. Bogumill GP, Sullivan DJ, Baker GI. Tumors of the hand. Clin Orthop Relat Res. 1975;(108):214-222. Butler ED, Hamill JP, Seipel RS, et al. Tumors of the hand. A ten-year survey and report of 437 cases. Am J Surg. 1960;100:293-302. Cardinal E, Buckwalter KA, Braunstein EM, et al. Occult dorsal carpal ganglion: comparison of US and MR imaging. Radiology. 1994;193(1): 259-262. Ogino T, Minami A, Kato H, et al. Entrapment neuropathy of the suprascapular nerve by a ganglion. A report of three cases. J Bone Joint Surg Am. 1991;73(1):141-147. Feldman F, Singson RD, Staron RB. Magnetic resonance imaging of para-articular and ectopic ganglia. Skeletal Radiol. 1989;18(5):353-358. Savage RC, Mustafa EB. Giant cell tumor of tendon sheath (localized nodular tenosynovitis). Ann Plast Surg. 1984;13(3):205-210. Narváez JA, Narváez J, Aguilera C, et al. 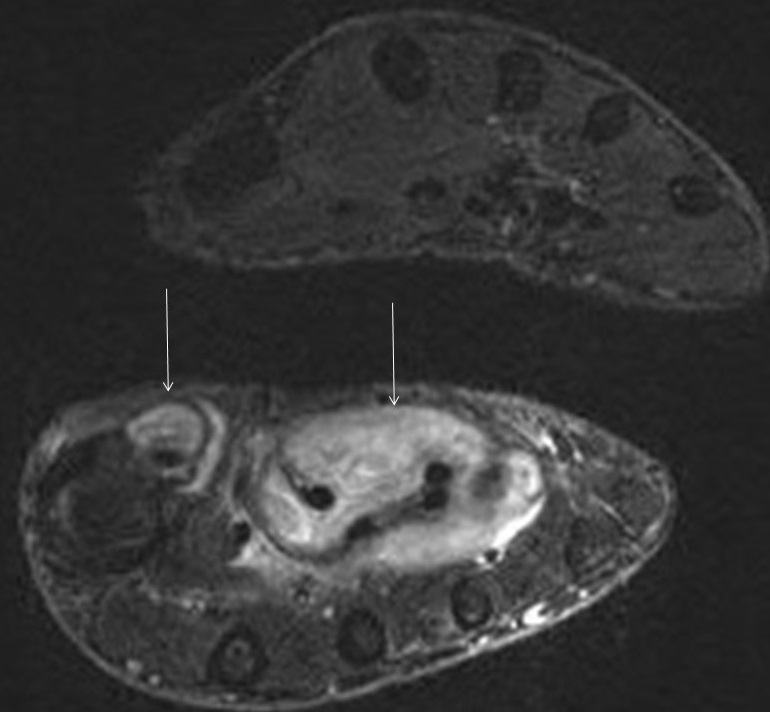 MR imaging of synovial tumors and tumor-like lesions. Eur Radiol. 2001;11(12):2549-2560. Allen PW, Enzinger FM. Hemangioma of skeletal muscle. An analysis of 89 cases. Cancer. 1972;29(1):8-22. Buetow PC, Kransdorf MJ, Moser RP Jr, et al. 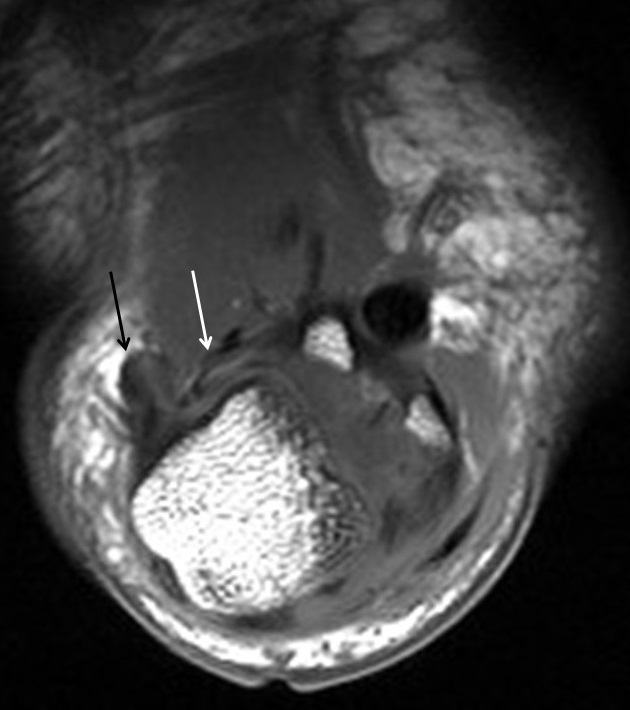 Radiologic appearance of intramuscular hemangioma with emphasis on MR imaging. AJR Am J Roentgenol. 1990;154(3):563567. Malone JC, Preston KS, Garner HW, Bestic JM, Wessell DE, Peterson JJ. 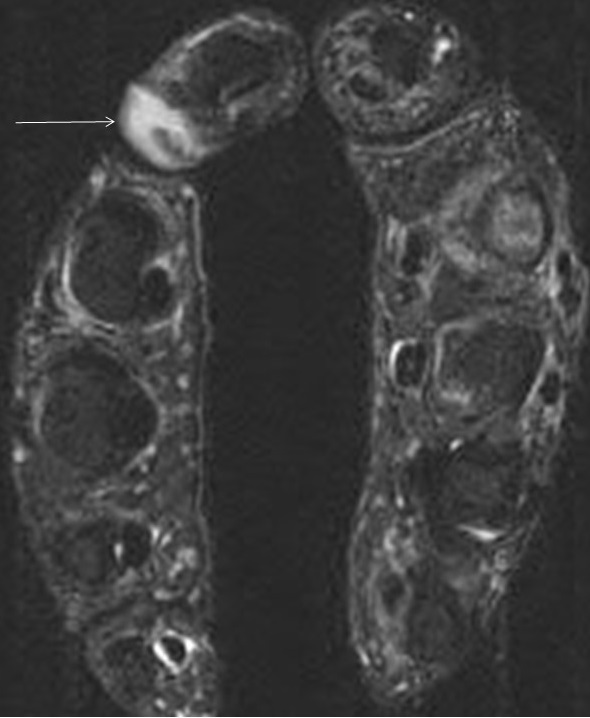 MRI of the hand and fingers. Appl Radiol. 2016;45(2):9-21. Jonathan C. Malone, MD; Kevin S. Preston, MD; Hillary W. Garner, MD; Joseph M. Bestic, MD; Daniel E. Wessell, MD; and Jeffrey J.
Dr. Malone, Dr. Preston, Dr. Garner, Dr. Bestic, Dr. Wessell and Dr. Peterson are radiologists at the Mayo Clinic, Jacksonville, FL.